How gorgeous are Deborah Lippmann glitters?! They are so pretty I want every single last one of them. 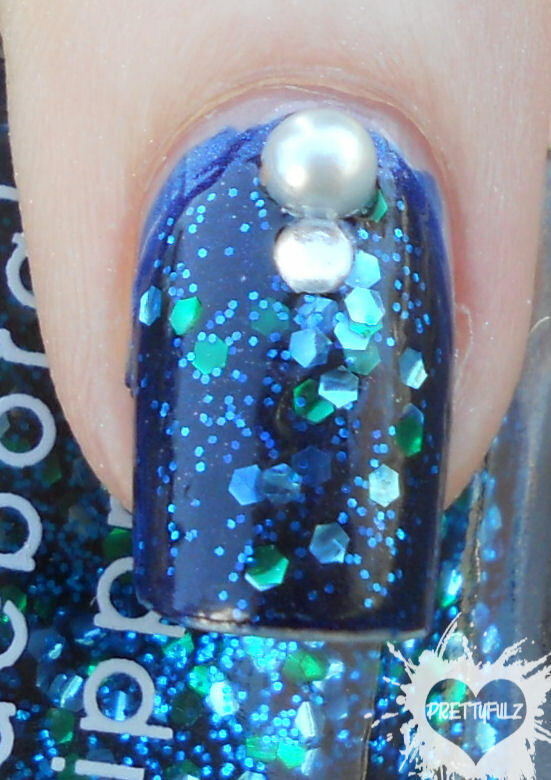 lol I used Pure Ice "All Night Long" which is a dark navy blue color for the base, then topped it off with 2 coats of Deborah Lippmann "Across The Universe" polish. I probably could have achieved the same color effect with a few coats of the DL "ATU" but I love this polish soo much I didn't want to use the extra coats if I can achieve the same effect using a base coat, so that's what I did. I think this and my Gosh polish are definitely my two favorites in my collection. I love polishes that don't need anything added to them to look this good, although my deco-tendencies made me add some pearls and rhinestones a few days later. lol I also used Seche Vite as my top coat, and this is the first time I experience shrinkage with this top coat. As you can see from the pics above, it looks like I have some slight tip wear, but the polish was freshly applied before the swatch pics. Meaning Seche Vite had to be the culprit lol. What do you think of this color? Do you like the color more just by itself, or do you think the decorations make it that much more beautiful? Which polishes have you used that you experienced shrinkage while using Seche Vite as your top coat? I love the new polish. Where do you buy Deborah Lippman? Also LOVE your new watermark! About SV and shrinkage, I had a lot of problems with SV and then I bought INM Out the door fast drying top coat and it is amazing. No shrinkage any more, my nail polish last longer on my nails, only drying time is little bit longer then SV. I am not going to buy SV any more.